It’s inevitable in a city that it’s important to keep your belongings secure and especially your bike on the streets. We’ve put together a few suggestions and tips that will keep your bike secure. Spend money on a bike lock cyclists or pay the price - Bike Theft Working Group. 4,950 bikes reported stolen in Dublin in 2014, up from 1,873 in 2008. 66% of bikes stolen in Dublin are locked using easy-to-cut locks and chains. 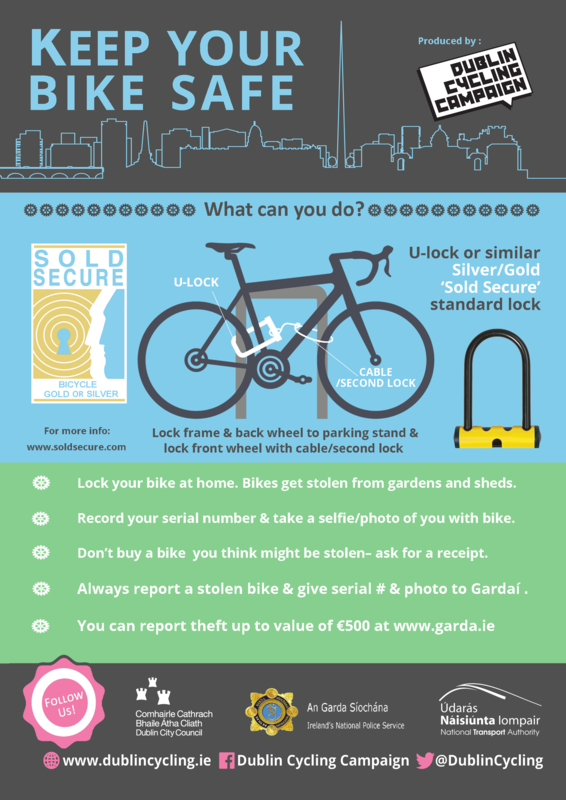 Cyclists need to use better locks and lock their bikes when at home to avoid being victims of bike theft according to a Bike Theft Working Group that has been set up through Dublin City Council. We’re pleased to offer Dublin Cycling Campaign and Cyclist.ie members exclusive discounted rates on award winning insurance for your bikes and kit, from Bikmo. Bike Theft Group - Latest News - It's all about the 4 Es! David Timoney, head of Dublin Cycling Campaign’s research group on tackling bike theft, gives an update on progress. Using our research results from December 2014, the Bike Theft Working Group has broken the problem down into four areas, “the 4 Es”. Were working on these issues in The Bike Theft Group through the City Council. Read more about Bike Theft Group - Latest News - It's all about the 4 Es! The images above give a summary of the results of the Bike Theft survey we conducted in December 2014. Over 1500 people completed the survey and of these over 1000 had had a bicycle stolen in Dublin in the last 5 years.